kthx, that totally fixed it. Is there a known mechanism by which this sort of error would be caused, and if so have you looked into it? Or should I continue reporting any invisible galaxies I find? I assume the Diameter value is a bug ? Yah, thought it looked extremely cool! If SE crashes while saving galaxy model to the disk, it will be corrupted. This is possible to fix by detecting such corruption and re-creating bad model. No. Wellcome to reality! Gravity lensing makes black hole shadow look bigger than it's event horizon acually it. 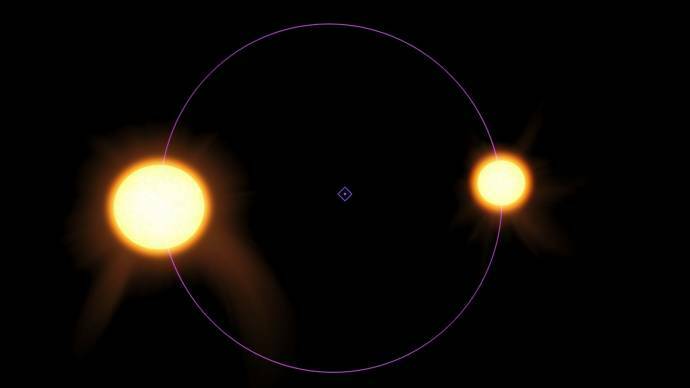 can you add the planet nine? It will not be added to SE until it is confirmed to exist. Right now it is only theoretical, not factual. Does that mean that it is no longer possible in the next version of SE to send a planet on a parabolic or hyperbolic orbit? For example, the earth? Why? Of course no. Why should I remove hyperbolic orbits at all from SE code? I just fixed a bug what made some procedural moons hyperbolic. No, procedural objects generating with hyperbolic orbits is not a feature. SpaceEngineer meant that the ability to give catalog objects hyperbolic orbits is a feature. Do not know if this is already known, but 'RadiusSol' is broken. These two stars are identical, except one has 'RadSol'; the other 'RadiusSol' as a parameter. Hmm. Looks like one of them is dividing or multiplying by 2 to convert radius to diameter, while the other isn't. An easy mistake to make. 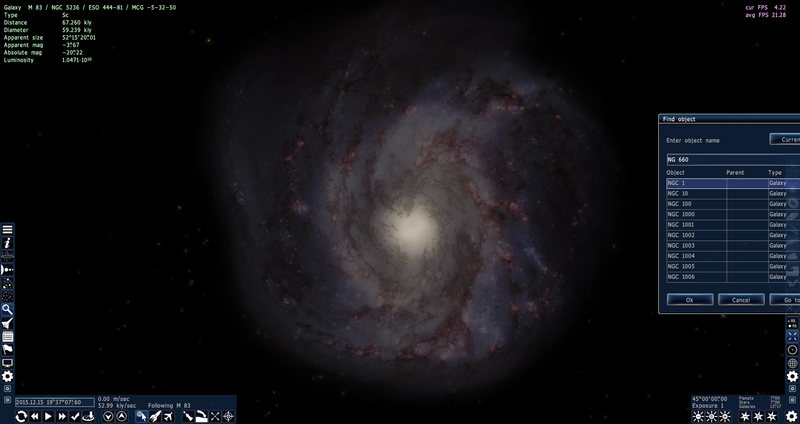 two graphics glitches found while viewing M 83 galaxy and NGC 660. Don't know if it is the same with everyone or just a problem with my hardware. Posting screenshots of those two here so that you guys can verify. Also, NGC 2936 looks very different from the pictures found of the galaxy elsewhere. I don't see any graphical glitches on my computer. Also according to the French Wikipedia, this is a E type galaxy. NGC 2936 is the spiral galaxy which is colliding with the elliptical galaxy NGC 2937 (collectively Arp 142). 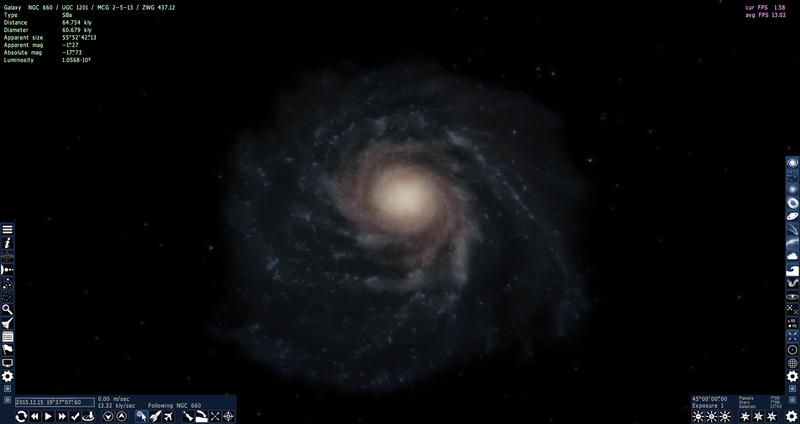 But space engine shows both these galaxies as elliptical. 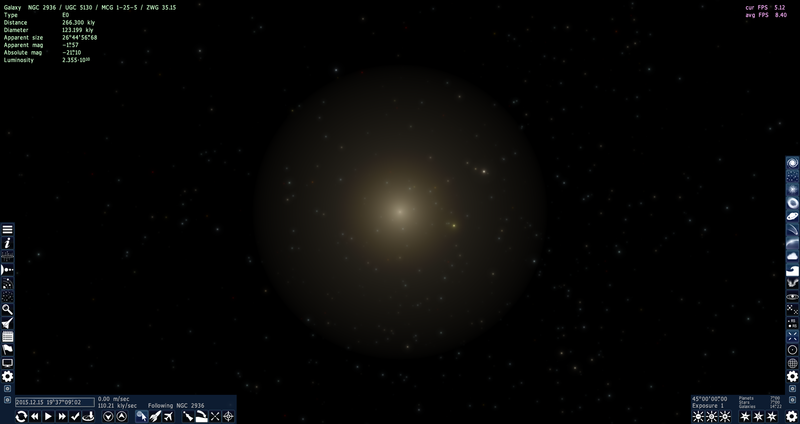 NGC 2936/2937. I'm gonna take a look at those glitches in version 0.973 to make sure if its hardware/memory related or not. I have that glitch occasionally. The problem disappears when restarting the engine.